I've been busy this summer & not worked on many miniatures, but my 1980s Syrian commando force for 15mm-scale Crossfire is nearing completion. Here are the Pinned / Suppressed markers that I have painted. I will use 1 marker next to an infantry stand for Pinned, & 2 markers for Suppressed. 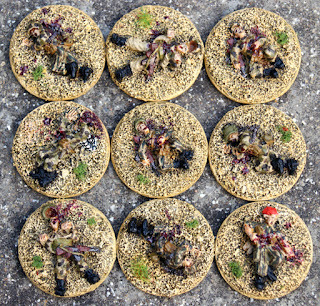 They are a mix of casualty figures from the Peter Pig AK47 Republic range, mounted on 1p coins - smaller than the bases of the actual infantry stands that I am using. I have painted these up like the rest of my commandos, in a mix of 'vertical lizard' pattern, the Syrian copy of the Pakistani pattern, & plain khaki fatigues. I want my force to have a slightly rag-tag, but still professional look, suggesting that they are an ad-hoc collection of surviving commandos, hell-bent on giving the IDF armour real trouble. Some of them have helmet covers, some plain Russian helmets, whilst another wears the characteristic bright orange Syrian 'elite' beret, & another a b/w keffiyeh. The blood has been coated in gloss varnish. They certainly do the job, no mistaking that these chaps are in trouble.